NEW YORK CITY (WABC) -- Traffic deaths in New York City declined for the third straight year, dropping to a record low of 229 in 2016, but pedestrian deaths increased slightly. 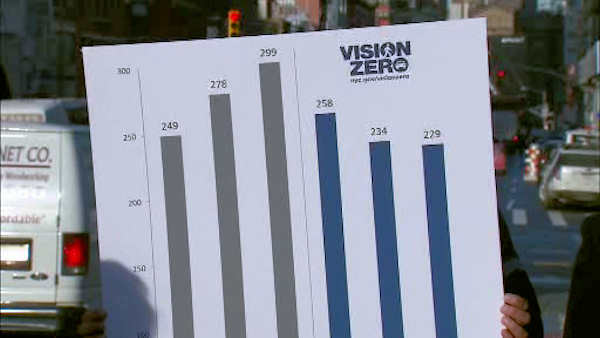 Mayor Bill de Blasio said Wednesday that the downward trend in traffic deaths shows his Vision Zero traffic-safety campaign is working. "No loss of life on our streets is acceptable," he said. "We are just getting started and can always do better, but I nevertheless want to thank the NYPD, DOT and supporting agencies on all their hard work to deliver another year of strong results." The traffic fatalities includes pedestrians, cyclists, motorcyclists and people in cars. The number fell from 234 in 2015. City officials say 229 is the lowest number of traffic deaths since record-keeping began in 1910. Pedestrian deaths, however, increased from 139 to 144. The first few days of 2017 have already seen seven traffic deaths, with the most recent being 88-year-old Feliks Dadiomov, who was hit by a car Tuesday night. Police say Dadiomov was trying to cross Ocean Parkway in Brooklyn against the traffic light. The city had nine such deaths in all of January last year.